At firehouse 23, Kal deals with the brash and arrogant Bennet, as the latter jabbers on about how remarkably fit he is. Kal would love to take the opportunity to humble Bennet a shade or two, but he has to make a stop to see an old friend - John Jones, private investigator. Of course, we're privy to the sleuth's real identity: J'onn J'onzz, Martian Manhunter. J'onn helps Kal get a handle on memories concerning the Trillians, the aliens accusing the Man of Steel of destroying their livelihood and setting the stage for a war that ravaged their planet. As it turns out, the Trillians are not so peace-loving and Superman's intervention in their affairs was response to an appeal from the Mangals, a feline-like species used inappropriately by the Trillians as laborers. It seems the history on the matter is skewed, but the Trillians want their revenge. Enter: Lobo, the baddest fraggin' bounty hunter this side of Polaris. He's been hired by the Trillians and he's out to collect on the Man of Steel. Story - 3: This issue did some nice character building for Kal's life as a firefighter, and continued to build on the antagonism of Bennet. While that was important, the real meat of these bones was Martian Manhunter. I love the character and was very happy to see him appear. Krul is doing a top notch job of incorporating all the classic characters into his vision of the Beyond Universe. It's not just fan service, either. He's writing these characters very well. Just the same, viewing this as a digital installment, I think we could've had a little less of Bennet. That part of the story could've been told in a few panels, freeing up room for more Lobo. The hanging drama would have felt tenser if it involved Supes and J'onn in a dilly of a pickle. 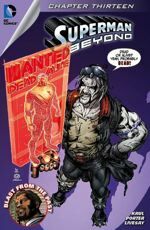 Instead we're hanging on the same note as last issue: Lobo's ready to crack some knuckles over Superman's head. Art - 3: Porter is doing more and more to hand in quality work. There's still lots of leg room that needs filling, but he's delivering better character renderings. His Martian Manhunter is particularly nice to look at. In addition, Livesay continues to be steady with inking duties. No complaints there. Cover Art - 4: Since covers seem less important for these digital comic books, it's refreshing to get one from time to time that really pops. I mentioned that the cover used for the last two issues was my favorite of the series so far. The cover here either trumps that, or is an exceptionally close second. I love it.